Both from a culinary and a medical perspective, the common curry ingredient, turmeric, is one of the most important spices. Researchers have found that it has outstanding properties as an anti-cancer and anti-Alzheimers's agent. Moreover, a landmark survey of all foods in the USA (American Journal of Clinical Nutrition, July 2006) found that turmeric is one of the top five anti-oxidant foods. This makes it one of the most valuable foods that we can use to fight cancer, Alzheimer's disease, aging and conditions associated with free radical damage and oxidative stress. Turmeric's principal compound, curcumin, is one of the most researched of all the spice compounds. Much of the research and interest in curcumin has centered on its role in preventing and treating breast cancer, but it has also been found to have protective effects against cancers of the bladder, stomach, uterus and cervix. When measured against other phytochemicals, curcumin exhibits at least a ten times greater chemoprotective potency against cancer than its closest rivals. Curcumin is known to protect against cancer through the following mechanisms. Assists the body's natural tumor-suppressing mechanisms. Destroys cancer cells by stimulating apoptosis (programmed cell death) in these cells thereby terminating the immortality so typical of cancer cell lines. Halts tumor proliferation by inhibiting DNA synthesis in the cancer cells and disrupting their replication. Inhibits the formation of the abnormal blood vessels that are essential for tumour growth. One of turmeric's most promising uses is in the prevention and treatment of breast cancer. Most breast cancers are hormone dependent, requiring estrogen as a growth stimulant. Tamoxifen, which is one of the most used drugs in the treatment of breast cancer, works against this hormone-mediated process, interfering with estrogen's tumor stimulating effects. Curcumin exhibits its anti-estrongenic effects by blocking the estrogen-dependent receptors on tumor cells, thereby interrupting the stimulatory effects of estrogen and slowing tumor growth. Curcumin may be at least as effective as tamoxifen as an estrogen antagonist, with none of the attendant side effects of this drug. Radiotherapy and chemotherapy are widely used, but imperfect treatments for cancer. Not only do they have serious, debilitating side effects, but tumor cells often develop resistance to these therapeutic modalities. They also activate COX-2 enzymes that are part of the inflammatory process underlying many cancers. Turmeric reduces the activation of COX-2 enzymes and sensitizes the tumor cells to both radiotherapy and chemotherapy, enhancing their therapeutic effects. Apart from curcumin, other phytochemicals found in turmeric are also known to have chemoprotective effects. Therefore, when it comes to prevention, it is better to take the parent spice, turmeric, rather than the pure curcumin extract. However, the treatment of existing breast cancer may call for more specific dosages of curcumin, the administration of which would need to be supervised by a qualified health practitioner. Curcumin exhibits several properties that make it a valuable preventive agent for these two devastating and increasingly common diseases. Although turmeric is probably most effective as a preventive agent against these illnesses, it may also help by improving cognitive problems and inhibiting further deterioration of existing disease. The accumulation of amyloid protein in the brain is an important factor associated with Alzheimer's disease. Its deposition is associated with oxidative damage and inflammation in the brain tissues. Curcumin is both a potent antioxidant and anti-inflammatory agent and has been shown to suppress oxidative damage, inflammation and the deposition of damaging amyloid protein in the brain. It is possible that it may actually disaggregate existing amyloid plaques and, in so doing, could possibly reverse the course of the disease. Another cause of amyloid deposition in the brain is probably due to the accumulation of certain metals, as higher concentrations of harmful metals have been found in the brains of AD sufferers that in non-AD individuals. Metal molecules that find their way into the brain can both induce amyloid aggregation and are directly toxic to brain cells. Certain chelating agents have shown promise in the treatment of Alzheimer's disease and curcumin's chelating properties enable it to assist the body in the removal of potentially toxic metals from the brain and other tissues. The abnormal proliferation of the brain�s non-neuronal cells is another pathological process that is associated with the development of both Alzheimer's and Parkinson�s diseases. Curcumin prevents the proliferation of these cells which, if allowed to continue growing, cause damage to the brain�s neuronal tissue. Much of turmeric's anti-inflammatory potency can be attributed to curcumin, which is both an effective COX-2 inhibitor as well as a strong antioxidant. 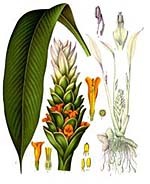 However, other phytochemicals found in turmeric, in particular the salicylates, also make a valuable contribution to its anti-inflammatory activities and thereby its preventive properties against arthritis, autoimmune disorders and the general health consequences of chronic systemic inflammation and degenerative diseases. Copper and iron are both essential nutrients but if they accumulate in excessive quantities they can cause serious and sometimes irreversible inflammatory and oxidative damage to a variety of tissues. Curcumin is a powerful chelating agent for both metals, binding to the metal ions and allowing them to be safely excreted in the urine. Traditional use and modern scientific research have shown that turmeric is one of the most valuable spices in our arsenal of disease fighting foods. Synergism between different spices enhances the bioavailability of important compounds such as curcumin. Therefore, to obtain optimum benefit from turmeric, it is important to take it with other common spices. Those who are serious about maintaining a healthy lifestyle in order to enjoy a good quality of life and reduce the risk of acquiring conditions like Alzheimer's disease and cancer would do well to ensure a daily intake of this golden spice. Keith Scott is a medical doctor who has a special interest in nutritional medicine. He has written several books on health related topics including Medicinal Seasonings, The Healing Power Of Spices and Natural Home Pharmacy. For more information about the preventive and therapeutic value of turmeric and other spices go to: http://medspice.com.